Rick Marrs, dean of Seaver College, has been named the new provost of Pepperdine University. 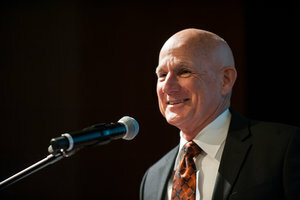 The appointment is effective August 1, 2014, upon the retirement of Darryl Tippens, who has served as Pepperdine's chief academic officer since 2001. "I am delighted to welcome Dean Marrs in his new role," said Pepperdine president Andrew K. Benton. "His leadership of Seaver College, embodiment of the Pepperdine mission, and tremendous qualities as a scholar and educator will equip him well as provost. I will be honored to serve this fine university alongside him." In his new role, Marrs will oversee the academic development and integrity of Pepperdine University and provide leadership to its five schools and colleges. He will hold primary responsibility for directing the University's academic programs, encouraging effective faculty scholarship and teaching, student learning, strategic planning, and a broad range of academic initiatives. "I am humbled and honored that the president has asked me to serve as the next provost of Pepperdine University," Marrs said. "Having spent the majority of my career at Pepperdine, I am thrilled to now have the opportunity as provost to help continue to move the University forward academically and enrich the mission. I especially look forward to working with President Benton to achieve the lofty goals of Pepperdine's strategic vision." A member of the Seaver College Religion Division faculty since 1987, Marrs was named dean of Seaver in 2008. He served as the Blanche E. Seaver Professor of Religion from 2001 to 2006. Marrs is regarded as an exceptional scholar of the Old Testament and the literature of the ancient Near East with knowledge of Hebrew, Aramaic, Syriac, Phoenician, and Ugaritic, and in the study of the Dead Sea Scrolls. Pepperdine University is a Christian university committed to the highest standards of academic excellence and Christian values, where students are strengthened for lives of purpose, service, and leadership.